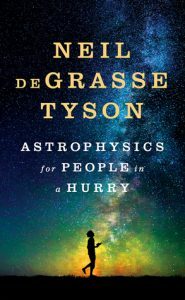 Neil deGrasse Tyson’s Astrophysics for People in a Hurry is an excellent, fact-packed book about science, space stuff, and physics for people who either don’t have the background in any of the subjects and want to learn more or for people who don’t have the time to read denser books about these subjects but still want to get a decent grasp on the concepts without spending a lot of time getting into the theoretical aspects of it. What I think I like best about this book is the fact that you can read a chapter at a time and feel like you’ve learned (or refreshed your memory) about some cool stuff that you can then use as a jumping off point for more research, just feel like you can have a general conversation about whatever the chapter covered, and/or understand some of the space concepts covered in the news or on social media. What I think I disliked most was the fact that if I read multiple chapters in one sitting without taking even the tiniest break between them I felt a little lost and confused. This book is definitely something you’ll want to keep on hand and flip through a chapter or two just before bed or in those times while you’re commuting or on a lunch break. NDT explains complicated subjects well a way that don’t sound condescending to the average reader (or me), and he interjects a lot of humor into his writing which sometimes helps explain some of the more elaborate things. If you’re interested in refreshing your astrophysics knowledge or learning more about space and what we know and don’t know is out there in the universe, this is a great place to start! Thank you to WW Norton and Netgalley for an advance copy for me to read! All opinions are my own. “Of course I do,” said Thor. But he didn’t. He was just doing whatever he felt like doing. That was what Thor did best. 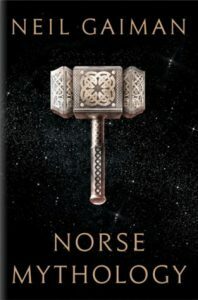 In the introduction to Norse Mythology, Neil Gaiman writes that he went straight to the sources for his retellings of these myths, the Prose Edda and the Poetic Edda. He interjects his own style of writing into retelling the old myths and brings new life into the stories. Norse Mythology is a great introduction as well as being an invigorating new look into tales for those who are already familiar with them. The stories are also perfect for reading aloud, and you don’t have to read them in order to really get full enjoyment out of them. I’m certainly going to be borrowing the audio book from the library so I can listen to Gaiman read them to me. I was, however, expecting some kind of Gaiman-esque twist or one of his signature dives into the weird, so if that’s something you’re expecting out of this, be aware that it’s exactly what it says on the tin. It’s Norse mythology told to us by one of our greatest storytellers. 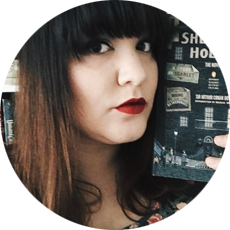 The stories themselves are dark and gruesome and at times very funny, and I couldn’t think of a more popular writer to make these tales accessible to everyone. Reading this was a perfect start to a new year. It feels both old and new at the same time, a talent Gaiman possesses and shows in many of his works. It’s ethereal, dangerous, and so much fun. It was sometimes difficult not to imagine Thor and Loki’s dialogue in their Marvel counterparts and that made me giggle out loud sometimes. … the Norse gods came with their own doomsday: Ragnarok, the twilight of the gods, the end of it all. The gods were going to battle the frost giants, and they were all going to die. Had Ragnarok happened yet? Was it still to happen? I did not know then. I am not certain now. It was the fact that the world and the story ends, and the way that it ends and is reborn, that made the gods and the frost giants and the rest of them tragic heroes, tragic villains. Ragnarok made the Norse world linger for me, seem strangely present and current, while other, better-documented systems of belief felt as if they were part of the past, old things. Norse mythology, and stories of Vikings and the like, always felt atmospheric to me. Of chilly and foggy springs and autumns, endless and gorgeous summer days, snowy winters; of gatherings of people in long halls with endless feasts and drinking; of stories and songs told and sung around fires, the passing on of knowledge through the rhythm of words. Neil Gaiman brings that to life in Norse Mythology, and I’m hoping he’ll do more like this or even write an extended tale of Norse inspiration like his fairy tale Stardust. Thank you to Netgalley and W.W. Norton for a review copy! All quotes are from an uncorrected proof, and all opinions are my own.